After nearly two decades of establishment and development, SUNHOUSE Group has owned the famous SUNHOUSE brand, joined the trillion companies group. SUNHOUSE Group is currently having 7 member companies and 6 factories, with a total area of over 60,000 m2, more than 2,000 employees, have succeeded in producing and trading household items and home appliances, essential kitchen. And become a friendly brand in the minds of Vietnamese consumers. Getting successful today, we are extremely grateful to our distributors, agents and strategic partners inside and outside of nation, who have accompanied and developed with us with the spirit "one way, one future "during the past time. 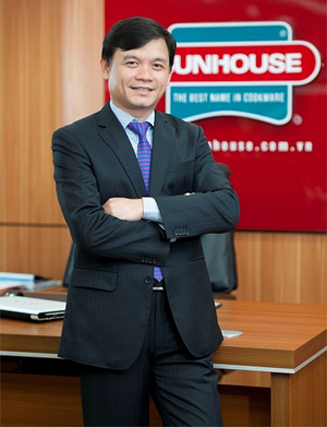 The success of SUNHOUSE GROUP's today is the result of hard working, working to the end of many generations of employees and initially formed the reputation of SUNHOUSE Group in Vietnam and is gradually asserting the brand name in the international market. SUNHOUSE aims to become a company of more than $ 500 million by 2020 and aspire to accumulate enough to invest in the international market. Nonstop of research, application the science for improving the quality and service. Give the best products for the safety health to the customers. SUNHOUSE focuses on the happy kitchen of the Vietnamese, serving more than 20 million households throughout Vietnam. The development of SUNHOUSE also confirmed the belief that a small and medium enterprises, with the support of the State, the standing side by side of customers and having the desire to reach out, right strategies can grow fast to become a big business. Once again, let me, on behalf of SUNHOUSE Group, express my deep gratitude to our strategic technology transfer partners, national and international suppliers, distributors and agents and consumers who have always loved, to create all conditions to develop SUNHOUSE as today.